We are a leading Manufacturer of plastic serving tray, fancy plastic serving tray, plastic tray and rectangular plastic serving tray from Mumbai, India. We are counted as one of the prominent name in the industry for offering a broad range of Plastic Serving Tray. Our offered products are designed and developed by making use of optimum quality raw material and progressive technology to set as per market standards and norms. These are commonly used for serving material to our guests. They are beautifully designed and are attached with comfortable handle for making sure easy usage. 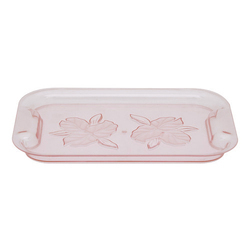 Fancy Plastic Serving Tray is one of the most attractive products that our company produces supplies. The product is available in various designs and in small size to carry out small duties while serving guests. They are made to meet the standard of national as well as international market. These items are used in hotels, restaurants or at home. They are non breakable as they are made with the fine quality plastic material and with latest prints and designs. We offer all these at a whole sale rate. Plastic Tray offered by us are manufactured with use of top grade plastic material. We are an acclaimed name engaged in offering our precious clients a superior quality range of Rectangular Plastic Serving Tray. 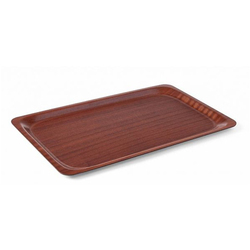 This serving tray is provided in customized sizes & other related options as per the market preferences. Offered serving tray is widely demanded in industries due to its crack proof structure. Our serving tray is manufactured with precision using excellent quality of material keeping in mind the predefined standard of industry.